This is a Standard high capacity cupboard. Modified to accept adjustable shelving with worktop area and modular storage trays in the lower section. 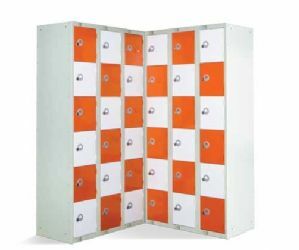 These are standard lockers with modified doors. Creating a secure mailing system within an open plan office area. Each compartment is accessed with combination code or master key access for management and security inspection. 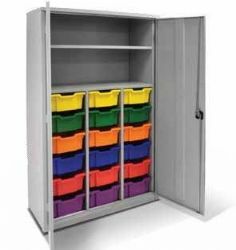 Standard two tier lockers with extra shelf for shoe storage below and personal items storage above. This is very similar to a golf locker. We have created similar for food factories for storage of hard hats and bump hats except the shelf has been at the top. Colour schemes are available - we can mix our standard colours to create alternative designs. Chequered patterns are very popular. 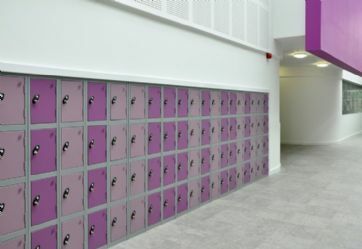 Standard lockers supplied with alternate door colours in vertical stripes. 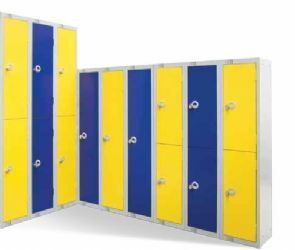 Standard 4 tier lockers with bespoke colours to match architects building colour scheme, supplied in mixed stripes, 1 2 or 3 wide. The colour locations may seem random but a project like this is always specified in detail. This is an example of a three tier locker, designed for use in a food factory. The doors have additional perforations. The base of each compartment has a plastic shelf cover which allows damp shoes or boots to be placed inside without causing rusting to the shelf. 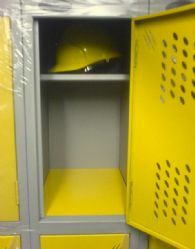 The extra top shelf is used for storage of hard hats or bump caps. 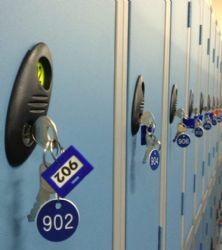 We can offer the full package of door numbering and key numbering with key control system cabinets. We supply engraved or self adhesive door numbers. This picture shows the rectangular key fobs as used in the key control cabinets, these fobs are also colour coded in sets of 10 for quicker identification.